Graham Rahal grabbed the IndyCar Series victory at his home track in Lexington, Ohio on Sunday afternoon. He also put himself in position to win his first series championship. 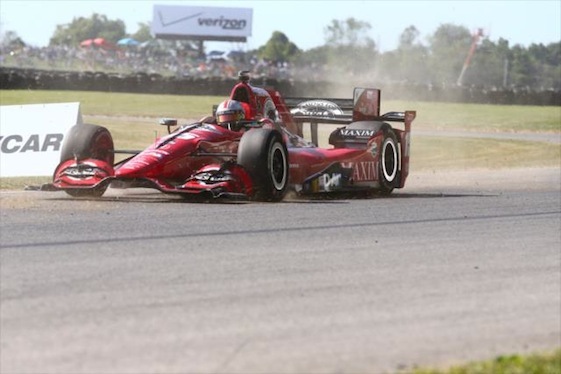 Graham Rahal was not all that happy following Saturday’s qualifying session at his favorite race track. He was wonderfully happy following Sunday’s IndyCar Series race at Mid-Ohio Sports Car Course. Rahal won the Honda Indy 200 on the winding, flowing road circuit and in doing so took a significant step toward winning his first series championship. The victory was his second of the season, it marked the Rahal Letterman Lanigan Racing driver’s fourth straight top-four finish and it moved him to within nine points of series points leader Juan Pablo Montoya of Team Penske. His father, Bob, a team co-owner, won at Mid-Ohio in 1985 and ’86. Making Graham Rahal angry on Saturday was a qualifying run that failed to move him into the second round of the the three-round time trials. Afterward he pointed a finger of blame at Sage Karam and a block for his 13th-place spot on the starting grid. But on Sunday, Rahal moved up, grabbed the lead for good on Lap 67 of the 90-lap race and from there held off road aces Justin Wilson, Simon Pagenaud and pole-winner Scott Dixon to get the win – the special win. “Honestly, if I’d won a lot of races in my career but I never won this one, I think I’d be pretty disappointed,” Rahal said. “For me and the Steak ‘n Shake team, that win means more to me than anything else, means more than my first win to me. This is the best day. “Strategy just worked today. Sometimes things just go your way and today was one of those days. For the Rahals, when it goes back to Jim Trueman (the late owner of his father’s car) and everyone else, this track has been pretty special to us for so, so many years. Jim was the man who founded this place, got this place going. He was also the one who got my dad started in racing. It’s come full circle. Pagenaud, like Rahal, had to overcome poor qualifying to earn a trip to the podium. “You know,” the Team Penske driver said, “it’s incredible. I mean, we had the worst qualifying of the year, but we actually have a podium at the end. It’s funny how it works. “We qualified well all season long, couldn’t really finish it. This time we did. Really good strategy from the team. A little bit of luck doesn’t hurt. We haven’t had much this year. Montoya led 21 laps in the middle of the race but finished 12th. Dixon, a five-time winner at Mid-Ohio, is now third in points, 26 behind Rahal. Verizon IndyCar Series Point Standings: Montoya 465, Rahal 456, Dixon 431, Castroneves 407, Power 406, Bourdais 379, Andretti 378, Newgarden 370, Kanaan 354, Pagenaud 329.